Los Angeles Wealth Management firm, “Wealth & Income Management Group” expands services and locations to better support its clients. This expansion just makes sense for our new and existing clients and is acutely aligned with our ongoing strategy to improve our high touch approach to service and performance. Top Los Angeles Wealth Management firm expands its services and locations to better serve its customers. “Our Mission is to guide our clients to a more secure and prosperous financial future through the management of wealth and income during every stage of life,” says Mr. Aaron Cook, the CEO of Wealth & Income Management Group in the Los Angeles area. Bambi Holzer and Aaron Cook have partnered to provide financial and investment advice to individuals, their families, executives, and business owners who seek a balanced, comprehensive approach to wealth management. Focusing on overall life planning, they assist clients in exploring and defining their goals and objectives, taking into consideration family, career, retirement, and other important aspects of a person's life. Wealth & Income Management Group’s financial expertise and Newport Coast Securities support staff of over 20 dedicated professionals are available to provide superior investment oversight and services. Wealth & Income Management Group focuses on guiding clients to a secure and prosperous financial future through the management of wealth and income during every stage of life and is headquartered in Beverly Hills with offices in Newport Beach, California and a satellite office on the East Coast. To learn more about the Top Los Angeles Wealth Management firm please go to http://www.Wealth-Income.com . 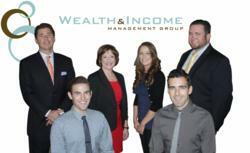 Wealth & Income Management Group, LLC: Securities offered through Newport Coast Securities, Inc. Member FINRA/SIPC. Investment advisory services offered through Newport Coast Securities, a Registered Investment Advisor, DBA Newport Coast Asset Management. The information contained herein is based on information available and believed to be accurate at the time it was prepared. Aaron Cook and Bambi Holzer are registered representatives with Newport Coast Securities, Inc., a Broker/Dealer and a member of FINRA/SIPC. This release is for informational purposes only and it is not an offer to buy or sell, or a solicitation of an offer to buy or sell any security or instrument or to participate in any particular trading strategy. Specific recommendations can only be made upon request of the client after a full review of their suitability has been conducted by the investment representative. Past performance is not a guarantee of future results. The content herein is not produced by Newport Coast Securities.